It was a morning well-spent. After hours spent working online, I took myself on a stroll to Canyon Road, Santa Fe’s bastion of renowned art galleries and boutiques. I’m on Canyon Road all the time, mostly to work from The Teahouse, a magical space where I can spend an afternoon and treat myself to a nice matcha latte and a gluten-free Key Lime pie while writing my behind off in their outdoor garden. Even on a brief walk along the road, it’s impossible not to stroll past dozens of galleries. Repeatedly I tell myself to slow down, stop in, pause and have a breather. Now, before you wonder aloud how it is that I don’t have time to take pause while living this galavanting digital nomad lifestyle, I’ll say this: being location independent isn’t a vacation, it’s a lifestyle. I now get to live in ever-changing places for extended periods of time, but I’m also working. There’s contract work, freelance work and a still-unlaunched website Ayaz and I are diligently producing with every spare moment. By living location independently, I’ve shaped my world so I get to work from different, (hopefully) awesome and interesting places. The bonus, of course, is that when I’m not working, I have the chance to explore new towns and their environs. On this day, I chose to take pause, and spend an hour alone, wandering. The inspiration for my date with myself wasn’t my own. I’ve started reading and working on The Artist’s Way with a group of like-minded women, and one of the core components to the program is a weekly “Artist’s Date.” The point is, with no distractions and no other people around you, you can take yourself out of your routine and do something — anything — for an hour or two. I chose to hit up Canyon Road, and finally get my art on. Before I was ready to launch into galleries, I made a few adjustments. First, I turned off my phone. There would be no texts, phone calls, or what’s sadly become my second-nature checking of Facebook and Twitter. 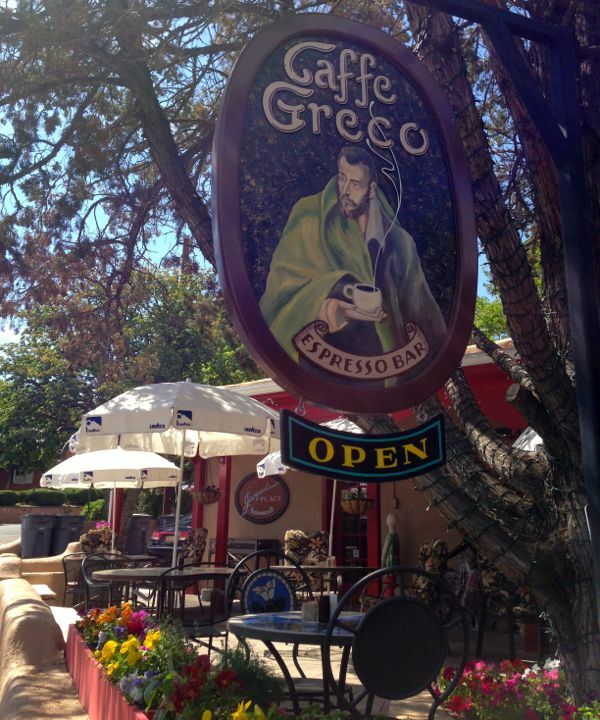 I meandered toward the Caffe Greco, which I typically pass in the mornings while looking wistfully at people relaxing, reading the paper, sipping their coffee and tea. On this day, I would get to be that person. Iced tea and raspberry-orange scone in hand, I sat on their terrace, without a distraction to occupy my eyes or mind. I sipped my drink, I nibbled my pastry and I was present. I even met what had to be the tiniest dog in the world named — no lie — Senor ChiChi. And it was good. Then onto the galleries. In one contemporary art gallery, I spoke to the owner and learned all about the extraordinary technique used by one of their sculptors to create a dappled, drizzled texture on the metal. She told me her husband was the painter of many of the pieces I had admired, and I was able to ask what inspired his breathtaking skies of navy, purple, orange, red and yellow. The answer? The view from their home high in Santa Fe’s hills. We talked about our love of dogs, and living in Manhattan (she’s from the Upper East). In Sherwood’s American Indian Art Gallery, I met a curator who was able to tell me the history of the extraordinary beadwork on the centuries-old dolls, cradles, saddle and hair pieces, as well as divulge facts about their detailed basket weaving and painting — much of it selling for many tens of thousands of dollars. In fact, after we had such a great conversation on the importance of human connections in society, she showed me some of their more spectacular objects, including a pair of beaded moccasins worn by none other than Sitting Bull. She pointed out how I could see the shape of his foot molded against the leather. Wow. I even had good sense to slow down, inhale deeply and appreciate the newly blossomed honeysuckle bushes. Delicious. 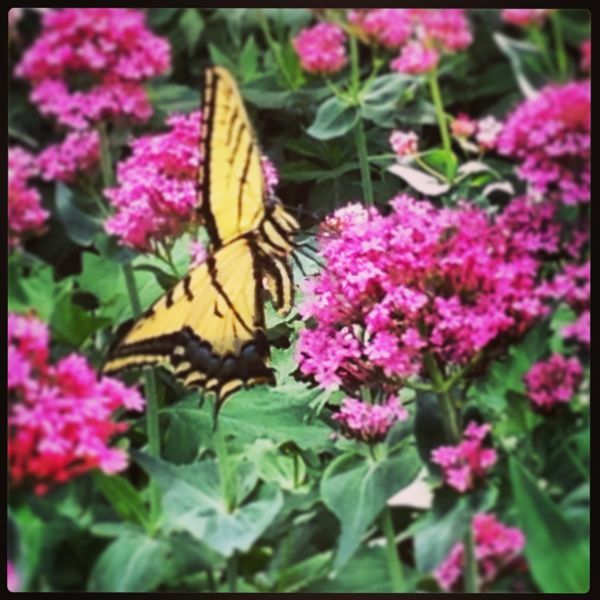 My mindfulness was rewarded with a glimpse of this stunning butterfly flitting among the flowering shrubs. It was only 2 hours, but it was rich. Heck, it inspired this post. I’m honestly not sure I could have made the connections I did on my own terms — without the nudge of this task. I hope this routine sticks. I also hope it will inspire anyone who needs the break to take a pause, find an hour or two, and just go it alone. Fully present. Oh, I love Santa Fe! How lovely it must be to have found yourself there for a spell. And as for the Artist’s Way? A friend just recommended I read it, but it’s been sitting in my Kindle for weeks. This post is a good prompt to crack it open! Thanks for the tip! I don’t have a great writing community…yet. But I’m working on it. Maybe if I start reading and writing about it, I can find others who are interested in connecting. It honestly might be worth just putting it out there on FB and seeing if any of your friends are interested. The women in my group are a unique lot — not necessarily writers at all, but artists, graphic designers, just general creative types. Maybe some people will come out of the woodwork?